Deep, deep south. That's where the weather in south-eastern Australia is coming from right now. A relentless conveyor belt of cold air is streaming north across the Southern Ocean to Tassie and the southern mainland, directly from the polar region. And doesn't this little guy know it. The freakish weather system was brilliantly illustrated in these two graphics by Weatherzone.com.au developer Andrew Miskelly. 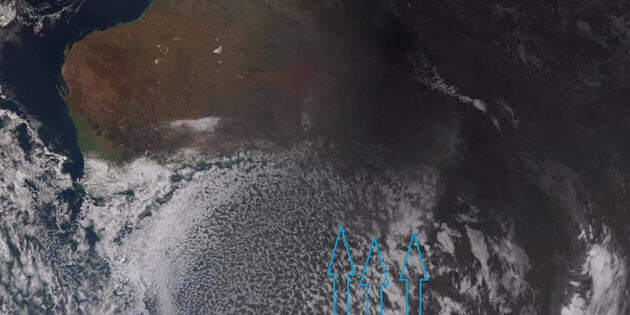 "The large field of speckled cloud over the southeast of the continent shows the cold unstable air mass that has been 'dragged' up from Antarctic latitudes." Dragged indeed. Normally systems like this lose a bit of puff on their way to Australia. Not this one. And that's why snow fell to extremely low levels by Australian standards on Monday night and Tuesday morning. And of course, extremely heavy snow continues to fall in the NSW Snowy Mountains and Victorian Alps. Thredbo, to name just one location, is looking at the possibility of a metre or more of snow by Friday -- and 32cm already fell on Monday. There are even reports that it snowed in Melbourne on Monday. "Just now a short sharp shower hit Melbourne and I could here it splashing the window behind my seat," Melbourne office worker Stuart Fletcher wrote on Monday afternoon on leading snow industry website ski.com.au. "I swear to you it almost looked like it could have been slightly sleety. I tried to take a photo of it streaking which you can see in the top of the photo and bottom right corner." This has been an interesting winter in Australia. Figures released by the Bureau of Meteorology last week showed it to be the fifth hottest winter ever (taking into account day and night temps), and indeed the hottest ever in terms of average daytime maximums. But there have been two or three intense winter storms -- each of which has brought extremely heavy snow. The snow depth is such that snow bloggers are now speculating whether this could be the first season since 1992 when an official depth of three metres is recorded in NSW. The current official depth is 189cm. -7° Champagne powder #blizzardofOZ3 delivering. At Perisher resort in NSW, where they already extended the ski season to the second week of October a week ago, the snow's so deep you can literally get buried in it. Meanwhile, it's going to feel like you're in the snowfields even if you're not -- across much of Tasmania, Victoria and southern NSW for the rest of the week.